SAN FRANCISCO, CA -- Three westbound lanes of the Bay Bridge have reopened about 30 minutes after protesters shut down all lanes just east of Treasure Island Monday afternoon. 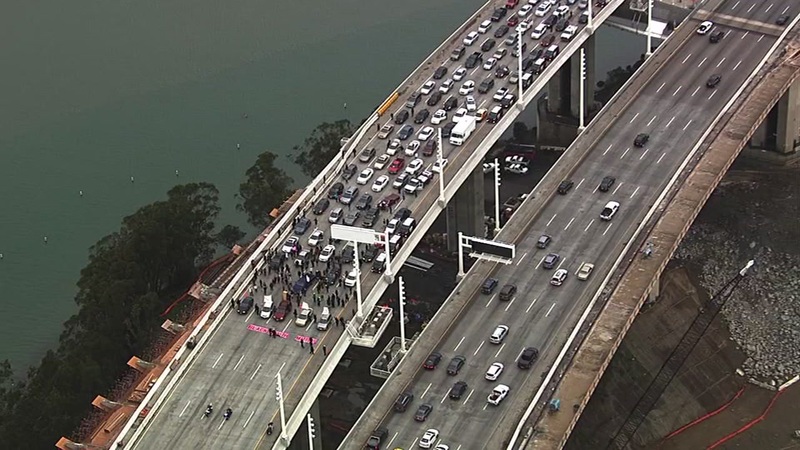 Protesters announced just before 4 p.m. they had shut down Bay Bridge traffic heading into San Francisco. They posted photos of several protesters chained to cars stopped across the bridge. Members of protest groups Black Seed and the Black Queer Liberation Collective took responsibility for the protest in a statement, citing recent police shootings. "We are here to move towards an increase in the health and well-being of all Black people in Oakland and San Francisco," the groups wrote in a statement. They are demanding divestment of city funds in policing, investment in affordable housing, the resignation of Oakland Mayor Libby Schaaf, the termination of San Francisco police Chief Greg Suhr and Oakland police Chief Sean Whent and the termination of police officers involved in several recent shootings. Activists are carry several different signs, some of which read "Black Health Matters." Another protest shut down the off-ramp to Interstate Highway 80 in Emeryville earlier this afternoon. That off-ramp remains closed, according to the CHP.